Let’s keep this simple: Total War: Warhammer was a very good strategy game. Total War: Warhammer 2 is better. The game continues Creative Assembly’s tradition of building on the release of a new Total War with a sort of semi-sequel. In the past we’ve seen a bunch of these, from Napoleon (following Empire) to Attila (following Rome 2), releases that are kinda pitched as full sequels, but which players can quickly tell still have a lot in common with the game they’re following, from unit rosters to the menus. Only this time TWW2 almost does feel like an all-new game. There’s just so much going on here, so much to separate it from its predecessor, from some enjoyable new races to a map that already ranks as one of Total War’s best. I was so ready to hate this game. Where the first game was set in the Old World, dominated by The Empire, TWW2 takes place in Warhammer’s New World, a completely fresh area where the human presence is limited to some pirates and colonists. 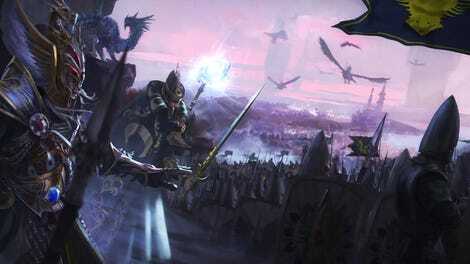 Instead, the focus here is on four new races: the High Elves, Dark Elves, Lizardmen and Skaven. The battle maps in this game can be absolutely stunning. Every single one of these are cool. The Elves are reasonably conventional but expensive and strong as hell. The Lizardmen are ferocious and fun. And the Skaven are a blast, able to scurry about underground and hide their settlements. The goal in the first Warhammer Total War was to hold off a massive Chaos invasion that would sweep in from the north of the map. That was a novel idea, and at some times for some factions (like my own review game as The Empire) it worked! Other times and in other spots of the map however it was less effective; I played a game as the Dwarfs once where the Chaos were stopped by the AI before they even reached my lands. In TWW2 that’s gone, and we have a new endgame. Which also happens to be the beginning and middle of the game as well. How? The map (and story itself ) is dominated by the opening of a giant magical vortex. Each faction is trying to interact with this vortex in some way, and this is done by performing a series of rituals throughout the campaign. That blue bar up the top tracks how many rituals you’ve performed. The pink and yellow lines here show two rival factions performing their own (you can follow them back to the source for a precision strike). To start one, you need to accrue a certain type of currency from territories you hold, and then to actually perform one you need to protect a selection of your cities from enemy attack for a certain number of turns while magic swirls from their buildings into the vortex. Complete one ritual and you can move on to the next, so if nothing else they serve as a handy yardstick as to how the game is progressing (letting you easily see who is “winning” at any one time). While you’re trying to perform rituals the other major factions are as well, and this is where the strategy of TWW2 is flipped on its head. See, the campaign here doesn’t care how many territories you hold or how many armies you’ve slain. It only cares about the rituals. So the old steamroller approach to Total War games, where all you care about is taking over more and more of the map, has been tossed out the window. Instead, we see here the crusading/raiding influence of the first Warhammer’s most enjoyable expansion races (Bretonnia and Norscaa), as players are now encouraged to ditch massive invasions in favour of surgical strikes. Yes, that dragon flew onto the ramparts and started burning dudes. Siege warfare in this game is small, but the focus makes them bloody little deathmatch arenas. If another faction is beginning a ritual and you want to stop it—something that will happen in a close game, lest the AI get ahead of you—you have two options: you could spend a load of cash and basically summon an army right at their doorstop (there’s a whole button devoted just to this), or you could send in a precision strike with your own units. Each ritual only lasts a handful of turns, so you probably won’t have time to launch a full-scale invasion of a rival’s entire territory; instead you need to get in, strike hard, smash the place up then get out. This throws a lot of established Total War strategy in the trash, and I love it. The challenge runs both ways, too: you have to worry about defending your own rituals while they’re taking place, which are sometimes in cities spread out across the map, forcing you to think a lot more about the placement of your armies than just rushing everyone to the front. The rituals definitely help alleviate one of Total War’s longest-running problems, which has been pacing, as older games tend to start well enough, ramp up into epic confrontations then fade out over the second half of the game into a dull slog. Here, the game feels more like a race than a fight, with factions constantly jockeying for the lead in the rush to perform their rituals first. Helping with both the feeling of freshness and aiding the new crusading strategy is the new world map, which is not only huge, but also super interesting to poke around. It’s divided into continents separated by large oceans; playing as the High Elves located in the centre, for example, you may never encounter the Vampires or Dwarfs at all, and the vast distances between each land really add to the sense of adventure (and remoteness) you feel striking out across the seas to attack an enemy. As for the rest of the game, well, for all the new stuff on show this is still technically a Total War quasi-sequel. So you’ll find many of the same races and units hanging around the fringes of the map, the same user interface, the same hero RPG focus, even the same narrator. This of course means that there are till some of the same old Total War problems as well. Diplomatic AI is still drunk, and a quirk from the first Warhammer—where foes would bamboozle themselves by declaring war on me, never attacking then offering me thousands in gold to sign a peace treaty—was very much still present in TWW2. Worst of all, the first Warhammer’s load times as you jump between the strategic and tactical maps are still an issue. Unless you have an SSD they are excruciating, measured in whole minutes. They’re so bad that as my campaign wore on I found myself simulating more and more battles just to avoid the delays. 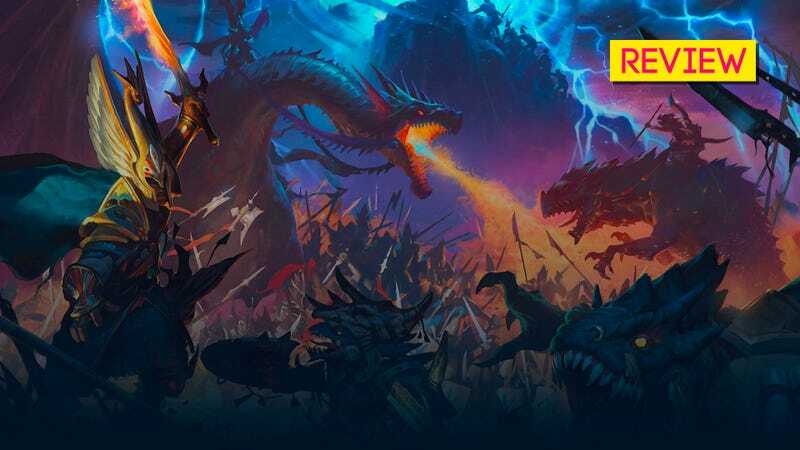 In my review of the first Warhammer, I mentioned how aside from releasing a fantastic strategy game, Creative Assembly had somehow managed to get me interested in Warhamme lore. They’ve done it again here; I had zero knowledge of any of these factions going into this game, but by the end I’d grown so fond of my very serious but lethal High Elves that I was having trouble saying goodbye to them and their beautiful little spot on the map (which as you can see above is just gorgeous, though the entire map is far prettier this time around than the more muted tones of the first game). In doing so, I’ve also been won over on the idea of these half-sequels. Warhammer 2 might have a lot in common with the first game, but everything it has done to set itself apart is big and fresh and daring, making this a game that’s worthy of its own place in the spotlight. "STRATEGY GAMES ARE VERY SERIOUS, MY LORD!" Takes one of the great strategy formulas and makes some very welcome changes. Takes one of the great strategy formulas and leaves some annoying quirks unfixed. Completed a 25-hour campaign as the High Elves, also messed around with the Skaven and Lizardmen for a while.